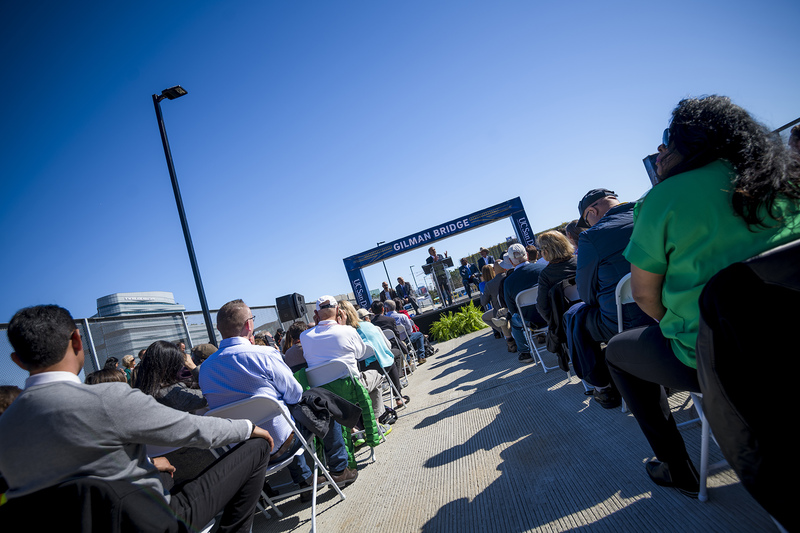 On Feb. 7, several hundred attendees joined UC San Diego’s Gilman Bridge Ribbon Cutting and Community Celebration, led by Chancellor Pradeep K. Khosla. Now open, the much-anticipated bridge unites Gilman Drive on the west and Medical Center Drive on the east, alleviating local street traffic and creating a more accessible campus. The 406-foot long bridge—designed for pedestrians, bikes, and cars—is one part of the campus’ Long Range Development Plan. UC San Diego’s transformation also includes the Mid Coast Trolley Blue Line Extension and North Torrey Pines Living and Learning Neighborhood. These enhancements will help address a growing student population and parking demands as well as better connect the university with the greater San Diego community. UC San Diego structural engineering alumnus Tony Sanchez, M.S. ’95, Ph.D. ’98, of global infrastructure firm Moffatt & Nickel, served as the engineer of record for the project. The university worked closely with regional partners to complete the bridge, including the San Diego Association of Governments (SANDAG), the California Department of Transportation (Caltrans), the Metropolitan Transport System (MTS) and the City of San Diego.